Well, maybe not mid-life, but definitely out of season. 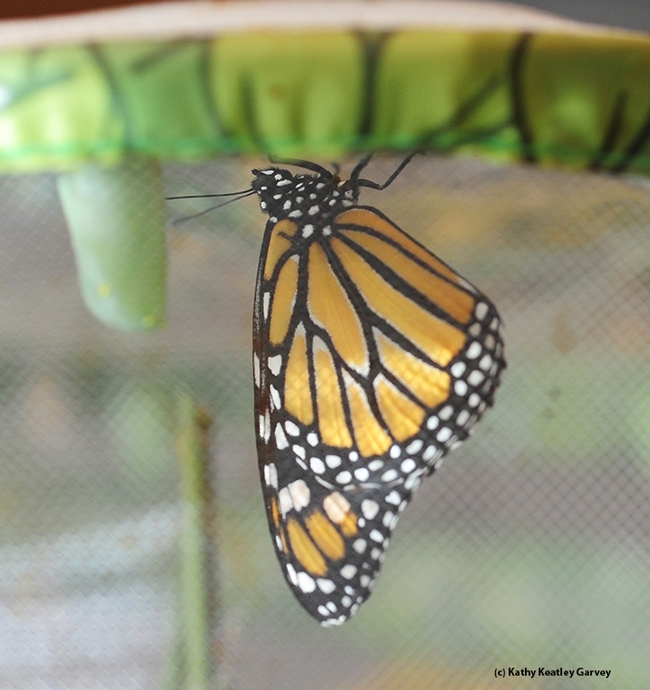 A female monarch butterfly eclosed today in our little indoor butterfly habitat. Two weeks ago, we “rescued” the caterpillar from a narrow-leafed milkweed plant in our Vacaville pollinator garden and brought it inside. Our goal: conservation. We sought to protect it from prey, including the resident scrub jays. 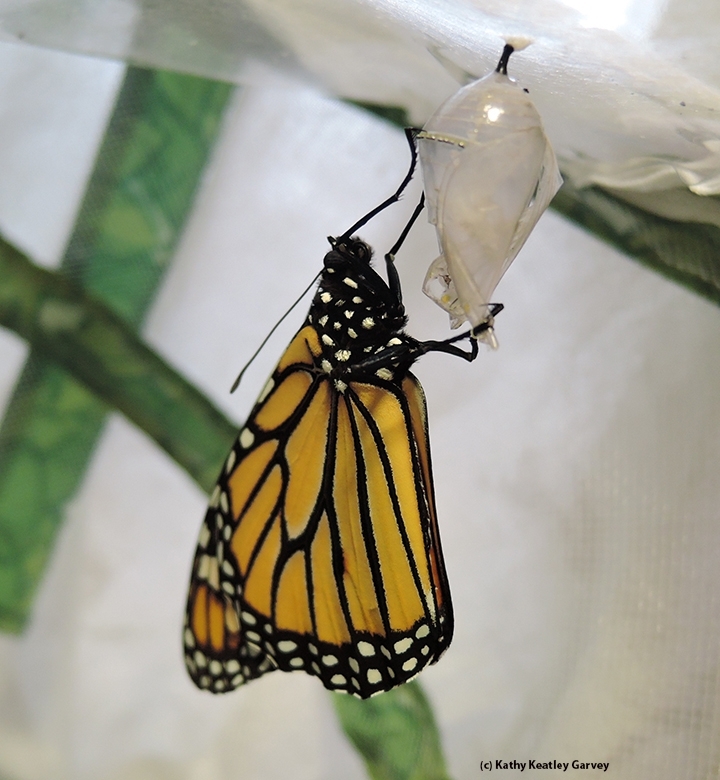 So, this morning, we lost a chrysalis and gained a butterfly. 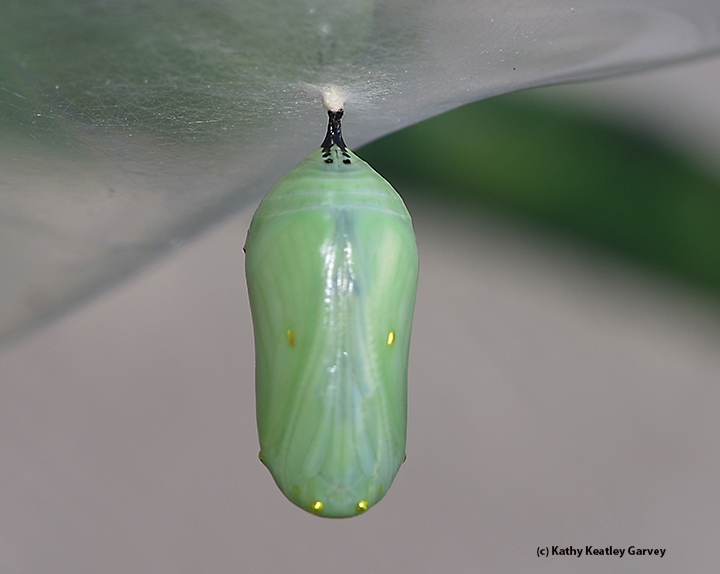 She was right on schedule: Eclosure after 10 days as a chrysalis. When the temperature hit 61 degrees at around 1 p.m., we released her. She fluttered a bit, and then soared straight up, a good 80 feet high. 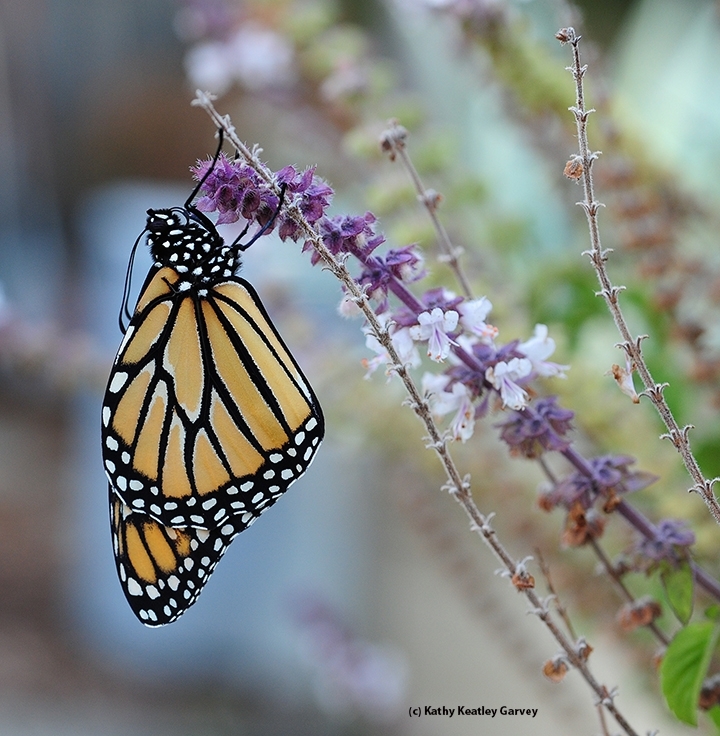 Usually when we release the monarchs, they flutter around, sometimes touching down on a bush and sometimes soaring over it. This one wasted no time. On its way to Santa Cruz? Not sure. At 3:30 p.m., we spotted a monarch butterfly--same one?--roosting on our African blue basil as a dozen honey bees buzzed around, gathering nectar. Meanwhile, the fellow members of her species are winging their way to their overwintering sites: the monarchs east of the Rockies to the Sierra Madre Mountains in Mexico, and those west of the Rockies to the California coast, including the Natural Bridges State Beach in Santa Cruz, and Pacific Grove in Monterey County. They cluster in eucalyptus, Monterey pines, and Monterey cypresses. Monarchs do not fly at night. They travel only during the day and then find a roosting spot for the night. 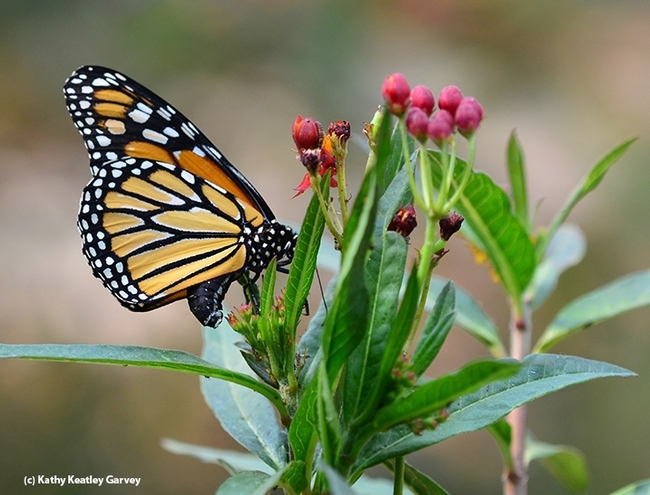 "Roost sites are important to the monarch migration," according to the U.S. Department of Agriculture's Forest Service. "Many of these locations are used year after year. Often pine, fir and cedar trees are chosen for roosting. These trees have thick canopies that moderate the temperature and humidity at the roost site. 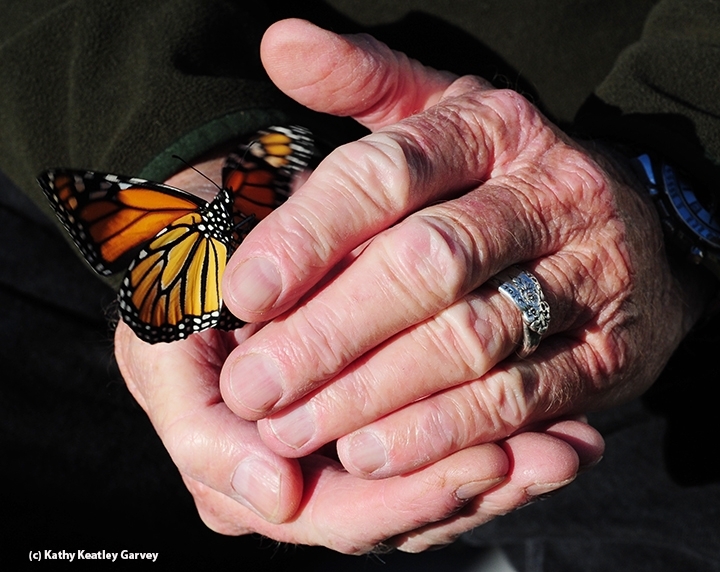 In the mornings, monarchs bask in the sunlight to warm themselves." How many miles can monarchs travel a day? Between 50 to 100 miles, the Forest Service says. "It can take up to two months to complete their journey. The farthest ranging monarch butterfly recorded traveled 265 miles in one day." 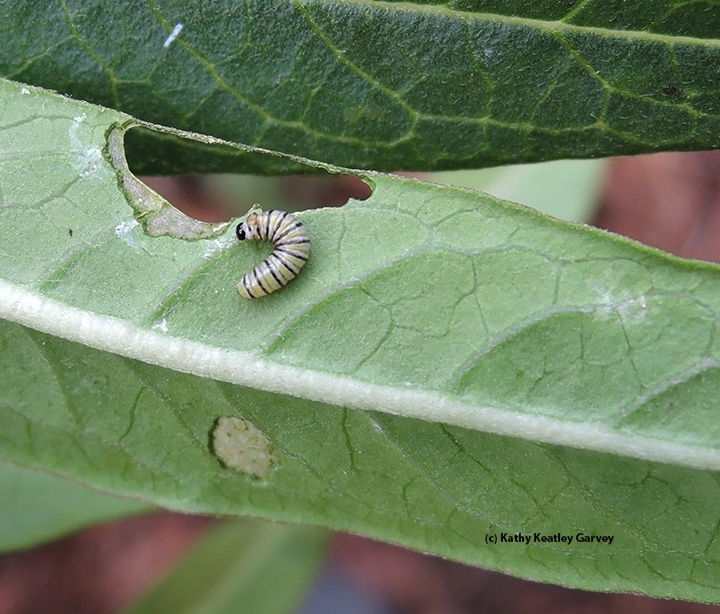 Monarchs use a combination of directional aids, including the magnetic pull of the earth and the position of the sun. They take advantage of the air currents and thermals as they head toward their overwintering sights. To think that we humans can barely make it out of the neighborhood without our GPS devices! As of 5 p.m., the monarch roosting on the African blue basil is still there. The bees are gone, back to the warmth of their hives. 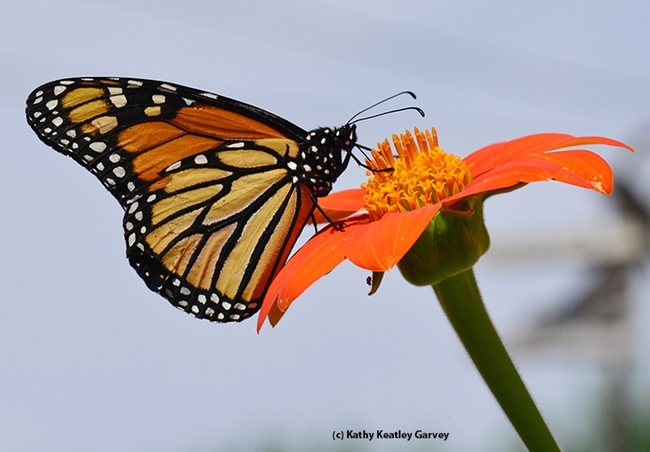 Tomorrow, our little buddy will warm her flight muscles, sip a little nectar, and take flight. Does Sneezeweed Make You Sneeze? Over at the UC Davis Arboretum GATEway Garden. off First Street in downtown Davis, sneezeweed is blooming and bees and butterflies are all over it. 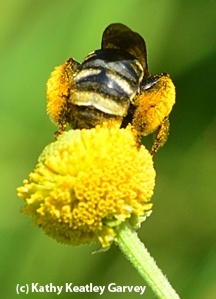 A female long-horned bee, Svastra obliqua expurgata (as identified by native pollinator expert Robbin Thorp, distinguished emeritus professor of entomology at UC Davis, zipped from one blossom to another. "It's a bee that prefers sunflower but will collect pollen from a variety of members of the Aster family," Thorp commented. He's the co-author of the newly published book, California Bees and Blooms: A Guide for Gardeners and Naturalists (along with UC-affiliated colleagues Gordon Frankie, Rollin E. Coville and Barbara Ertter), a must for everyone who wants to learn about bees and blooms. The GATE in GATEway Project means Gardens, Arts, and The Environment. It's a portal into the UC Davis Arboretum, a welcome retreat, an enjoyable walking jogging and bicycling site, and an educational experience for UC Davis faculty, staff, students and visitors. Be sure to check out the other GATEways in the Arboretum, including the Animal Science GATEway Garden, the Geology GATEway Garden, and the Nature's Gallery Court. The U.S. Department of Agriculture's Forest Service devotes a page to the sneezeweed. "Its abundant yellow blooms can be found in late summer to fall, often attracting bees and butterflies. Common sneezeweed can be found in much of the United States, in moist to wet openings, edges, shores, and thickets." "Like other members of the aster family, the 1-2 inch sneezeweed flower is composite—with large, showy ray flowers that look like petals, and smaller disk flowers making up the center," writes Sue Trull, Ottawa National Forest. She points out that thebright yellow "petals" are wedge-shaped, with three lobes on the outer end, drooping away from the central disk. The center is nearly spherical, projecting above the skirt-like whorl of petals. The center disk flowers are a duller yellow color than the petals. The plant's stem branches near the top, resulting in many flowers on each plant." 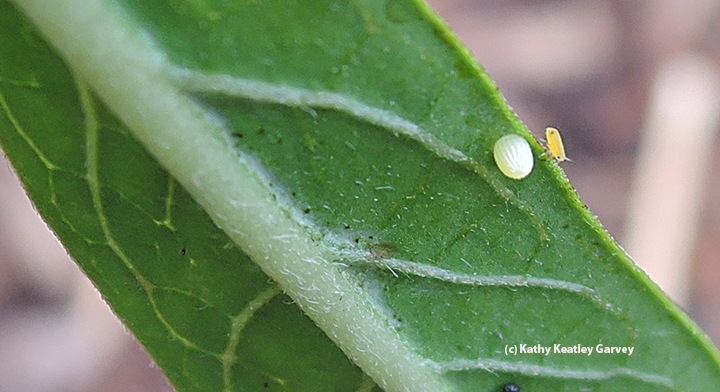 "Sneezeweed leaves are lance-shaped to narrowly oval, with a few teeth. These leaves occur alternately on the stem. They are directly attached, with the leaf base continuing down the stem as a wing. Sneezeweed stems can be slightly hairy and they can reach five feet or more in height." If you don't want to call the yellow flower a sneezeweed, you can call it by its other common names, including Helen's flower, bitterweed, autumn sneezeweed and false sunflower. Trull says the genus name, Helenium, "refers to the famous Helen of Troy. There is a legend that these flowers sprang from the ground where Helen's tears fell. The species name, autumnale, refers to the season of the flower's blooming—autumn. Synonyms for the scientific name include Helenium canaliculatum, H. latifolium, and H. parviflorum." 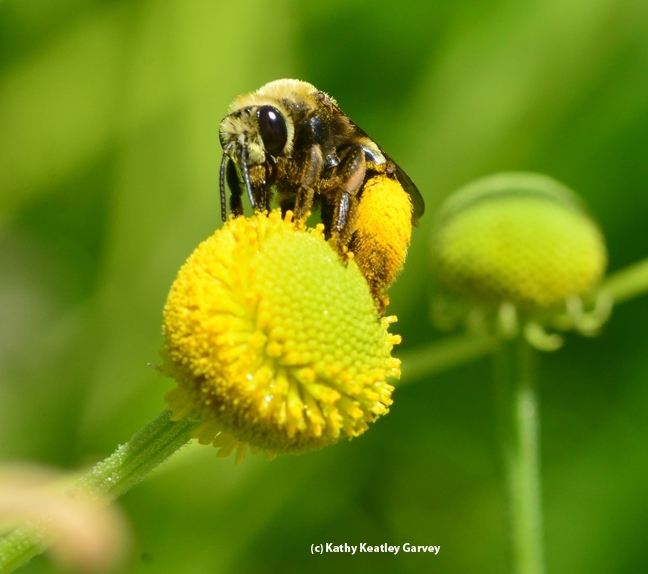 How did it get its name, sneezeweed? "According to a 1923 publication by H. Smith of the Milwaukee Public Museum, the name given to the plant by the Menominee Indians of the Wisconsin area is 'aiatci'a ni'tcîkûn,' which means "sneezing spasmodically," Trull says. 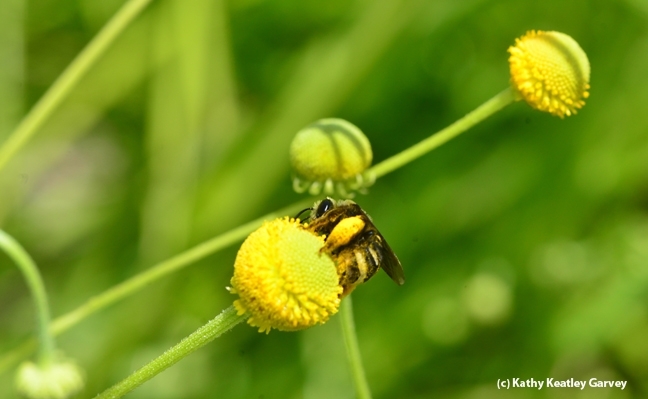 "With its large showy flowers, insects pollinate common sneezeweed, not wind," Trull writes. "Therefore, it does not have small pollen grains, like ragweed does, which cause sneezing and other hay fever symptoms. This is not the reason for the Menominee and English names for the plant. The common name is based on historic use of the crushed dried leaves and heads to make a form of snuff that caused sneezing. In certain cultures and times, sneezing was regarded as a desirable way to rid the body of evil spirits or a way to loosen up a head cold, so that a sneeze-producing remedy was desirable. Having crushed dried sneezeweed heads to collect the seeds, the author can attest to the plant's sneeze-producing power!" But you don't want to eat the leaves, flowers or seeds. They're poisonous if eaten in large quantities, Trull says. They cause gastric and intestinal irritation to us human beings--"which can become fatal." You also don't want livestock, especially sheep, or Fido around them. The poisonous substance this plant produces serves to protect the plant from pathogens and herbivores--but not from pollinators!